Worried about the weather forecast? Here are a few tips for you! Often, a rainy forecast in Hawaii can mean nothing more than a few passing showers that last five minutes and leave stunning rainbows and colorful clouds in their wake. Fortunately, we are also located on the driest side of the island, and often the weather will miss us even when it is raining everywhere else. We always keep a close eye on the weather, and when it’s obvious the dire weather forecast is right, we call and reschedule. But often, rain elsewhere on the islands can mean nothing more than a few clouds, which actually have the potential to add the perfect touch and unique lighting to your photos! For this engagement photoshoot, the clouds softened the harsh sun allowing for subtle lighting on the skin, adding great depth and emotion. While a cloudy sky before sunset may be foreboding, sometimes there is even more color at sunset with clouds as the clouds reflect the sunset colors back onto the water. Simply put, when there is not a cloud in the sky, the sun sinks into the horizon, and then that’s it, but when there is a nice spread of clouds, they act as a canvas for the sun to paint colors over, holding the color even after the sun has sank. For this couple, the clouds provided soft light and blues, and then as the sun lowered the clouds enhanced the vibrant sunset colors. What if it actually rains? Of course, if it is raining we are always happy to reschedule. For this reason, we always recommend booking towards the beginning of your stay, so you have some wiggle room to reschedule if you need to. But what if it’s your last day, and your only chance to capture photos together as a family in Hawaii? 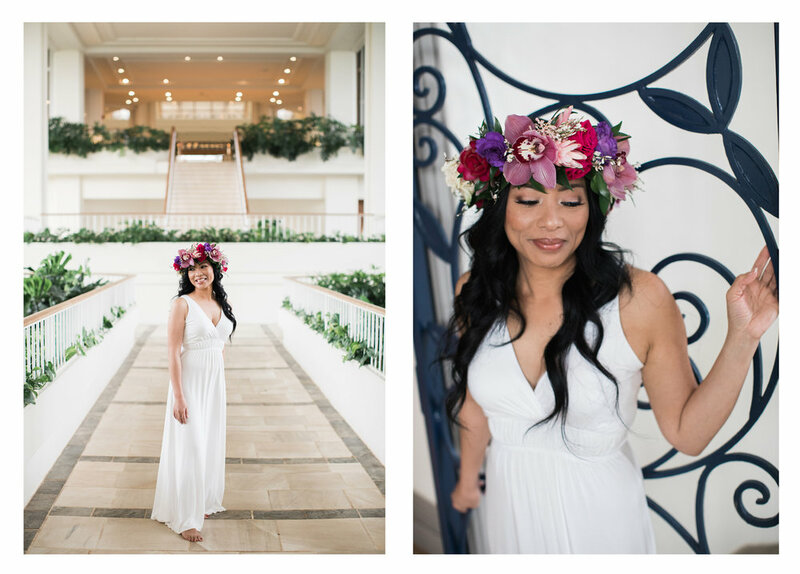 For this lovely lady, it was raining when we started our shoot, but she was unable to change dates, and didn’t want to cancel because she wanted photos of her experience in Hawaii and the haku she made through the Four Season’s Wayfinders workshop. Determined, we headed to some of the more scenic indoor locations throughout the resort to take advantage of the stunning architecture and features inside the resort. As sunset approached, the rain let up and we were able to sneak away to the beach for what turned into yet another stunning cloud painting. Not a bad way to end your time in Hawaii Nei!